Customers are eager to listen, but are you effectively speaking to them? In the latest installment of our six-part What Consumers Want series, we examine ways to bridge the communication gap between you and your consumers. The results of our most recent survey*, titled “Yodle Insights: What Consumers Want from Local Businesses,” demonstrate a communication gap between businesses and their consumers. Simply put, consumers want to hear far more information than local businesses are sharing. Are you ready to close the gap? Read below to learn more. Of the consumers polled for our survey, 76% expressed that they prefer communication via the digital channels of email or social media (more so than phone calls, text messages or traditional mail). So before you spend another dollar on snail mail marketing campaigns, make sure that your email marketing strategy is on point and that your social media presence is established. Speaking of social, Facebook still reigns above all other social media sites when it comes to consumers looking to engage with their local business owners. Of the consumers polled, 45% follow local businesses on social media via Facebook, while just 18% did so on Twitter and an even lower 13% on Pinterest. This is something to note as you navigate the deluge of digital social platforms to determine your social media strategy. In this same vein, our survey revealed that an overwhelming 75% of consumers polled go online to research a business before they decide if it is the right choice to meet their needs. However, it’s not all about search engines: 42% of consumers use online review sites or social media sites when they look for a new business. So they want to listen…now what? We’ve established that consumers are eager and ready for your online communication, but what do they want to hear exactly? A whopping 84% of our survey participants want to receive helpful advice or tips from their local businesses, while more than 50% of participants want to receive appointment notifications online as well as service updates. 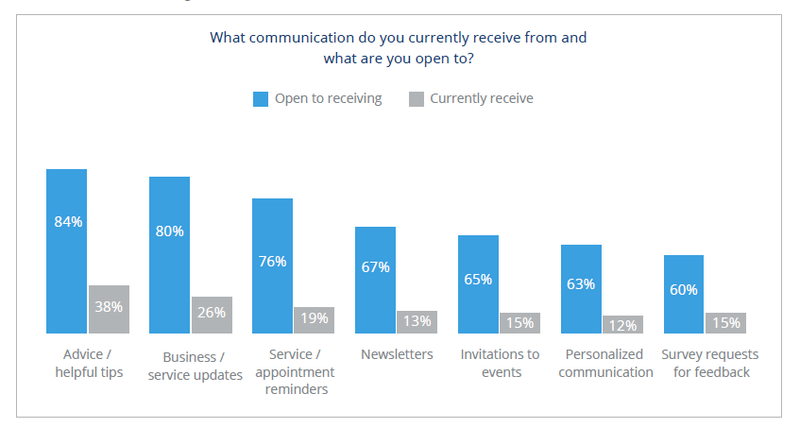 Customers also prefer to receive newsletters and event invites via the internet. Naturally, any information that is relevant to consumers such as changes to hours, sales, and incentives can—and should—be presented to consumers online. The fact is, too many businesses are overlooking the importance of maintaining their online connection to consumers. Our survey can provide local businesses with keen insights about what consumers want. When you communicate with customers in a manner that is pleasing to them, your business stands to gain. Fortunately, you don’t have to take our word alone for it; the survey results speak loud and clear about the communication gap that exists between businesses and consumers. Improve your communication efforts and you can enhance your business. * In April 2015, Yodle commissioned an independent online survey of 6,000+ U.S. consumers, including 200+ local respondents in 20 mid-market cities, via a third party research firm. Growth Hacking & Inbound Marketing: Which Is Best For Your Company?